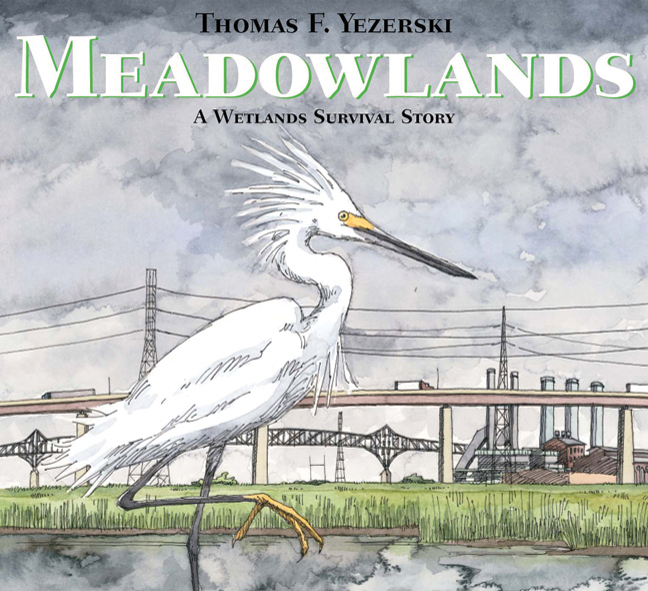 Meadowlands: A Wetlands Survival Story delves deep into the historical, social and natural significance of one of America’s most well-known estuaries. Author/illustrator Thomas Yezerski treats us to a well written and intricately illustrated sojourn through this important wetland. Many of us have traveled through the marshy area on I-95, I-80, one of New Jersey’s numerous state routes, flying into or out of Newark’s Liberty Airport or via Amtrak or NJ Transit trains — intent perhaps on getting to our destination or rubbernecking at the views of the Manhattan skyline directly across the Hudson River. Personally, I found the area depressing, but that was before I got to know it a little better (full disclosure: my family has close affiliations with Waterkeeper Alliance waterkeepers Hackensack Riverkeeper and NY/NJ Baykeeper— two organizations which actively advocate for the health and recovery of the Meadowlands region). 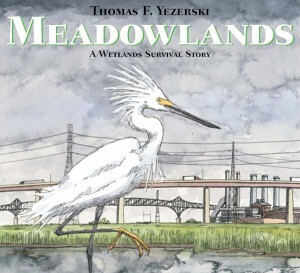 The story told in this book is ultimately a clear eyed look at the history of the Meadowlands, providing a surprising amount of hope for the beleaguered urban industrial estuary while deftly illustrating the resilience and adaptability of the region’s wild populations. Yezerski traces the rich social history of this area, beginning with the Lenape tribe’s presence, when the Meadowlands supported about 20,000 acres of wetlands. With the arrival of Dutch settlers in the 1600s, logging removed many of the area’s trees. Roads and buildings were constructed, paving the way to the area’s importance and prominence as industrial superstar — an informal designation no wetland should earn. By the 1960’s, merely 11,000 acres of wetlands remained and the estuary and it’s surrounding areas had been filled, dammed, diked and trashed (literally). “The garbage dumps grew into trash mountains. Methane gas from the trash exploded and burned. Creeks turned poisonous, and the wind smelled like paint. Fish and birds fled to find better places to live.” Pretty disheartening, right? It got even worse until the 1980’s when an emphasis on development over industrial production led to initiaves that called for the creation of homes, malls and stadiums. To build these structures, the Meadowlands were filled in further and by 1985, less than 7,000 acres of wetlands remained. The picture Yezerski paints is bleak. And then, the book’s tone shifts. Historical accuracy necessitates emphasis on negative aspects of our society’s development and the deleterious impacts on this particular wild area, but the author ends his book with optimism and a great deal of hope for the future of this ecosystem, forever in transition. The illustrations in this book are fantastic, but our family especially loved the depictions of the wildlife that lives in the Meadowlands, from the mummichogs to the osprey to the fiddler crabs. We can’t wait to paddle around this spring and look at the area with new awareness. Leading the pack will be the youngest of our crew, who recently took a field trip to the Meadowlands Environmental Center, featured in the story. Many of us are familiar with the rapid destruction and loss of wetlands in our nation. Whether or not your family lives near or has familiarity with the Meadowlands, this book is a wonderful find for families, friends and educators who are interested in a wetlands-based tale of renewal and hope. In the face of such a hopeful ending, I’d be interested in hearing the author’s perspective on American Dream, a complex slated to become one of the largest malls in the United States, sited in…the Meadowlands. I would add too, that the story is easy to read aloud to young children, an EXTREMELY important quality that books like this often miss. Sounds like a great book and great field trip! We just recently have begun exploring small wetlands in our area so this may go on our list of future reading/future trips. Thanks for the review!